Hepatitis A is a disease of the liver caused by HAV – the Hepatitis A virus. The HAV is found in stool, but the disease can be passed via consumption of infected foods and drinks. The disease tends to spread easily in households. Hepatitis A can cause flu-like symptoms, diarrhea, stomach pain and jaundice. Jaundice causes yellow skin, yellow eyes and dark urine. These symptoms are associated with bilirubin build-up. Hospitalization occurs in 20% of infections with the disease lasting one month or more. Loss of work and school may occur during this time due to severe symptoms. Children are typically vaccinated for Hepatitis A between one and two years of age. 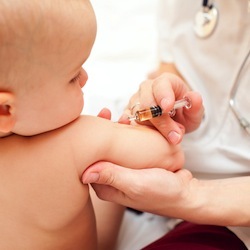 If the vaccine is not administered by the second birthday, it can be given to older children and adults. Additional vaccinations may be needed for travelers or those living in communities where Hepatitis A infections are prevalent if the original vaccination was not complete. Two vaccinations are needed to protect against Hepatitis A infection. Pain at the injection site is the most common side effect of the Hepatitis A vaccination. Other common symptoms may include fatigue, headache and decreased hunger. Severe allergic reactions have been reported in some cases. Symptoms of a severe allergic reaction may include hives, wheezing, increased heart rate and dizziness. People with chronic liver disease and patients taking clotting factors should not be given the Hepatitis A vaccination. This includes children. People with a history of severe allergic reaction to vaccinations should talk with their health care provider before having the Hepatitis A vaccination. Older children and adults can be vaccinated against Hepatitis A, if vaccination did not occur during childhood. Children under the age of one should not be vaccinated against Hepatitis A. Adults who have never been vaccinated against Hepatitis A may need to be vaccinated before adopting a child from an area where Hepatitis A is common. If a child or adult has a severe reaction, seek medical help immediately. Severe allergic reactions to the Hepatitis A vaccination, though rare, can lead to death. Mild reactions, like injection site pain and mild fever, can be treated with over-the-counter medication, as prescribed and authorized by your physician. High fever should be immediately reported to a physician.